Rudbeckia Cosmos by Portia Munson © 2017. Portia Munson is an American visual artist who works in sculpture, installation, painting and digital photography, focusing on themes related to the environment and feminism. 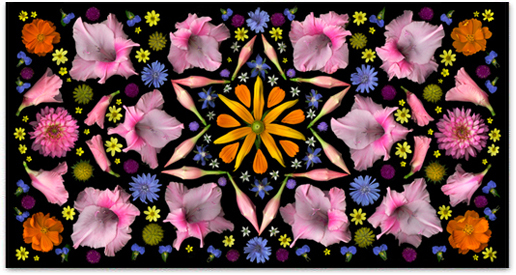 She meticulously places flowers and buds from the garden to create these mandalas (the circular form symbolising the universe in some philosophies). You can find out more on her website. I creep slowly by darkened walls. The very last thing I want is for anyone to see me. Keeping in shadow is best. A shadow does not betray you; it makes you safe. This back-pack is long and wide. It is bigger than I am. My back feels on last legs. Why do I need so much stuff? I’m stooped over due to the weight of the bags. I’d like to stand upright but can’t quite make it happen. Questions have risen to my lips. What past wickedness am I guilty of? I must’ve done something truly bad to have ended up this way in my life: Bent double – or near enough. When I look out I see my toes. This is not what I would wish. It is not the sky. A man should be tall and straight. I am not this ideal. So in an earlier life I must have done very terrible things. This new life moment is connected to the thread of what I have been, after all. I don’t remember anything but that’s not the point. I am working my way through my destiny. That is all anyone can ever do. Now this second, I am walking towards my home. We will call it home because I don’t know what word I should put in for doorstep. Yes this doorstep I think of as my home: I sleep there, I eat there, same place. I come here at night and leave in the morning. Call it B&B then? Is best I check the bins on my way, before the rubbish collectors get to them. Then I’ll have plenty of good stuff to eat. It’s criminal the amount of food that gets thrown away. The thread of life. I can’t actually see it but then my eyesight was never one hundred per cent. It’s within me though all the same. For everything goes back to something else. I also find it hard to picture that what is to come will be born out of the now. Because the present moment dominates your imagination and makes it seem as though there’s nothing else. But there is. Past and present coil together keeping the seeds of the future warm as toast. As I’m crossing Lower Marsh I see another fellow in shadow sloping along like me. He’s waving across. It’s Trev, a guy who sleeps in a station alcove. Nice spot with smell of vanilla from the croissant shop on the other side of the wall. When I reach home I take out the old sheet I keep in my back-pack and wipe the step. And when I see the boteh jegheh all pink and purple, I feel this heady mixture of happiness and sorrow. Because the sheet has been with me for many years and it reminds me of both things. I remember journeys I have undertaken during that time. The step is not too wet so I spread out the sheet and look at it. And I recall the day I bought it in Chandni Chowk with sudden money I got when my oldest auntie died. And how it has been with me ever since. I see the me I was back then, parcelling up the sheet and putting it in the basket of my bicycle; the me who rode with a knowledge of its being there through the teeming city streets; the me who brought the sheet on the plane from Delhi to London, packed flat at the bottom of my suitcase. And the me who lived the life of a student in a bedsit with the decorative sheet covering my bed which I shared with many lovers. Sheet makes me smile at this point. It witnessed how I was happy being in love – till disenchantment set in. Then turned wet as my tears fell onto it when I lost my job and couldn’t find another. Now, here is this same sheet on my doorstep reminding me I am a survivor of these and other tragedies. Sheet makes me see the parts and the whole. As I am staring down I hear a sound of bitter crying from far along the street, past the market frames. It is a lady with a frail look about her. She is freezing she says when I go up to her, her jacket being too thin for the night. So I fetch my paisley sheet and I fold it in a triangle and wrap it around her shoulders like a shawl. Now I have less weight to carry. The world is in me. I do not need to see the pattern to know how the thread is woven. Jay Merill is working on flash fiction about rough-sleepers in London UK following a series in the Big Issue. Her work appears or is forthcoming in Storgy, 3:AM Magazine, the Citron Review, Corium, Foliate and many others. Jay is a current Write Well Award nominee, and is the winner of the Salt Prize. She has two short story collections published by Salt, ‘God of the Pigeons’ and ‘Astral Bodies’ and is Writer in Residence at Women in Publishing.